We have unparalleled expertise in federal project facilitation services for Department of Energy’s (DOE) Federal Energy Management Program (FEMP) Energy Savings Performance Contracting (ESPC). Our team includes seven FEMP-approved Project Facilitators, with extensive technical and financial experience related to ESPC projects at federal facilities operated by a wide range of Federal Agencies. 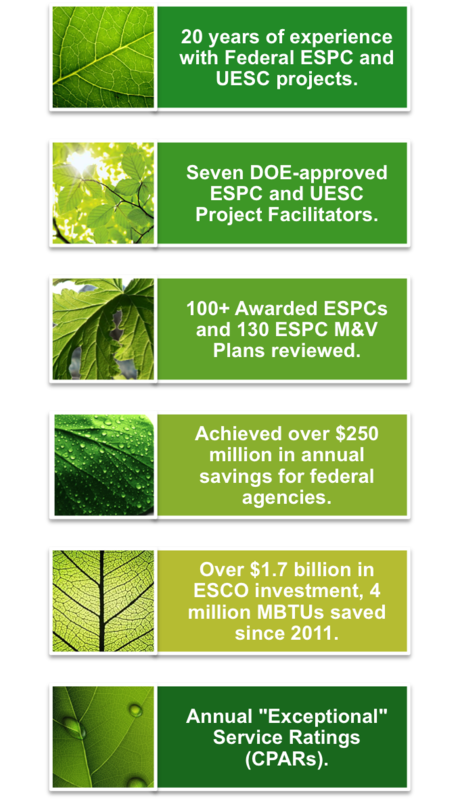 Our program has achieved over $250M in annual savings for federal agencies, with more than $1.7B in ESCO investment and 4M MBTUs saved in just a five-year period. Our dedicated PF team seamlessly supplements the skills of the agency team from initial development through the performance period: identifying issues, keeping the ESCOs accountable, and our recommendations are made with substantive, relevant technical justification from EMP2’s database of awarded ESPC projects. Our staff has worked with state programs along with our continued involvement in the FEMP ESPC program. We understand that varying contract vehicles used between agencies and on the state level approach ESPC differently. We tailor our services to fit the needs of each project. We do not try to supply a “one size fits all” set of services. Simply, we save our customers significant time and money with our approach. Below are several features and deliverables we provide that are exclusive to our PF program, plus the enhanced suite of services offered for Measurement and Verification of ESPC and UESC projects. Recommendations are made with substantive, relevant technical justification from our database of awarded ESPC projects. Streamlined review process to verify key performance parameters to be verified during the baseline, IGA, Cx, PIR, and M&V stages. Tailored review forms for each stage of the ESPC process, covering the PA, IGA, TO-RFP, Cx, PIR, and annual M&V stages. New process steps including baseline development plans to ensure appropriate framework for technical and financial proposals. Our team has unrivaled expertise in the ESPC M&V process, and strong reputation for responsiveness, risk mitigation, and comprehensive review processes. Our extensive, diverse ESPC backgrounds offer a clear understanding of risk and consistency throughout the performance period. As a part of our standard work scope, PFs ensure that proper M&V methodologies are developed appropriately and accurately to ensure the proposed guaranteed savings will be verified through the methodology. Responsive to agency’s timeline, with review steps clearly communicated. Robust M&V review checklist and technical report generated for each performance period. Assess data collection to verify that M&V intent and requirements were met. Detailed review of calculations to determine if savings were achieved. On-going log of key monitored performance parameters. We provided consultation and co-authored the newly updated M&V Guidelines: Measurement and Verification for Performance-Based Contracts, Version 4.0 (November 2015), based on the updates to the IPMVP M&V that have occurred in recent years. EMP2 had authored the FEMP M&V Guide 3.0 and the M&V Guideline that is currently used by the Department of Veterans Affairs for use on specific energy projects where developing energy baselines and tracking energy efficiency is paramount to project success.